Serving Los Angeles, Orange County and beyond, our mission is to provide a complete all-inclusive event live streaming solution so that you can focus on your event while we manage the technical, creative, and logistical operations. Stream to multiple destinations simultaneously including Facebook, YouTube, Twitch, Twitter, or your organization website. There are options for public or private viewing pages with custom registration and paywall integration. We supply the A/V equipment, crew, live streaming network, web development, customer support, and marketing analytics. Additionally, with our Failsafe stream protection process you get the peace of mind knowing that your live stream has the best safeguards in place against failure. You only get one shot at it when it’s live! Event Live Streaming and webcasting is what we do. We are passionate about customizing solutions for our clients which consists of businesses and organizations spanning most of Southern California. We travel out of state as needed but most of our work is concentrated in the Greater Los Angeles area, Orange County, Ventura County and San Diego. When working with us, the first step is to develop a plan and workflow that fulfills your vision and budget. If need be we can supply lighting, PA, internet, and presentation gear or interface with the venue’s equipment and technicians. Before the event we coordinate with the venue to make sure all prerequisites are met. When appropriate we will go onsite to survey the room and test the internet. It is also during this pre-event period that we set up the live streaming distribution network, viewing web pages, and optional registration / password / pay-per-view systems. When it’s showtime, our crew will arrive early for setup (in some cases the day before). We have all the necessary live streaming service equipment including HD cameras, video switcher, streaming encoder, audio mixer, recorders, routers and redundant FAILSAFE components. Your show is then streamed and recorded to the destination(s) of your choice. Depending on the platform we use, your content may be immediately available for replay or we can edit and upload your files for on-demand viewing. We will also provide you with a high resolution local recording of the event. In addition to our on-site live streaming production service we have a studio for enhancing your video both before and after the event. This includes graphics & titles, insert stage with green screen, video editing, color correction, voice-over recording, sound mixing, and DVD/Blu-ray authoring. For those who would prefer to produce their own in-house live streaming events on a regular basis we have a solution for that as well. We sell complete ready-to-go systems backed with pre-sales consultation, installation support and training. You can discover all of these options by visiting our Live Streaming Equipment page. We invite you to ask questions and seek our advice for your particular event. Live stream to multiple social media destinations such as YouTube or Facebook Live. Other popular options include Instagram, Twitch & Twitter. Complete Hi-Def camera & audio packages from single-camera to multi-camera set-ups with professional crew custom tailored to meet your vision and budget. Your video can be viewed on a variety of platforms and websites. We can host for you or supply an iframe for your webmaster. Keep your message secure and protected with our private live streams that offer user authentication with global or unique passwords, geo-restrictions that allow only certain regions access, and embedding protections that restrict which URL can host your broadcast. We have a customizable registration system to support automated online sign-ups for your event. We set up and administrate a video pay wall complete with customer service for your subscribers. We utilize the latest remote collaboration technology, including Skype to include presenters at distant locations. We capture visuals as they happen from the projection system. No need to upload slides or video files in advance. The audience sees the slides and presenter side-by-side or full frame. Options to include your viewing audience in the discussion using built-in chat box or audio return. In situations where internet is unavailable we supply the internet uplink using modern 4G cellular bonding technology. Essentially, multiple wireless connections are integrated into one robust data path. Our extensive experience with cellular bonding for live streaming has evolved into a stand-alone cellular internet solution for all kinds of events. We provide an on-site technician and manage the entire network for you. For more information click HERE. Cloud-based recording and DVR functionality offer immediate playback for your audience. We offer unique one-stop equipment packages that includes consulting, system design, equipment procurement, configuration, testing, installation assistance, and training all for one fixed package price! Typically we handle the keynote address, panel discussions, and workshops. Including product launches / demonstrations / focus groups & market research. Center stage talk show production, on-the-floor interviews with exhibitors. We have a mobile streaming setup to cover these types of events whether indoors or outdoors. Town hall meetings and other civic functions. We have wireless roving cameras to cover the action on the red carpet as well as on-stage activities. We cover Concerts, pageants, musical theater, recitals, and more. Typical scenarios include all hands meetings, shareholder meetings, and employee training. We provide the front-end A/V production to integrate with your webinar platform. When quality matters you don’t want to be stuck using a webcam! For those who want their own in-house live streaming capability we can help with that too. 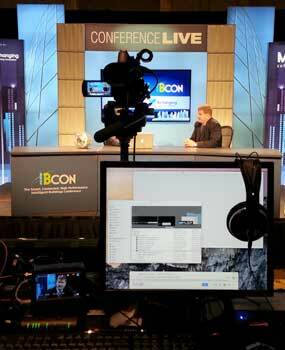 We are experts at designing and configuring live streaming systems with years of in-the-field experience. If you produce Continuing Education Seminars, we have the perfect solution to extend your market globally. Combining our 2CAM+ streaming package with our registration, pay-per-view, and Attendance Verification, solutions, you can earn additional revenue while offering professionals in your field Live CE credits while attending online. Our Engineering Team has the critical problem solving skills to protect your broadcast. Webcast & Beyond event live streaming services are utilized across all sectors throughout Los Angeles and Orange County including: Major Brands / Non-profits / Corporate / Military / Entertainment & Education.